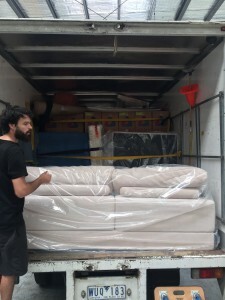 There’s lots of different ways to pack a truck but this article will give you a general overview of the best way to protect your furniture. If you’re not sure wether to do it yourself or hire movers this guide should give you an idea of the kind of day you’re in for. 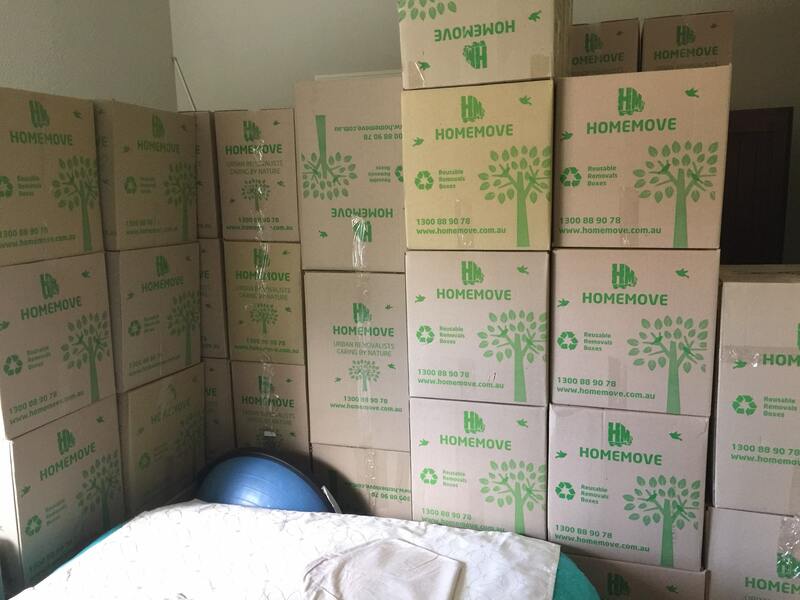 So get ready, because in a few short paragraphs you’ll know how to pack a removalists truck! Start by taking all boxes, bedside tables and other square furniture on the back wall. What you are trying to do is build a wall and move forward. As you can see in the photo on the left making walls from boxes is easy, the hard part is smaller and more oddly shaped items. they will need to be packed into small gaps in the wall you’re making. Things like pillows and bags of clothes are great gap fillers. The tighter the pack the better as this means things will shift less on the drive. Once you’ve built as many walls as you can its time to block it all of with the beds. Keep in mind that if the wall shifts during transport because it was not packed tight theres a good chance you’ll damage the goods you’re trying to transport. You can use mattress and bases to hold back the walls of boxes you just made. In-between mattresses you can store glass and artwork. Storing glass and artwork this way means that you are less likely to accidentally break it while packing the rest of the truck, just be sure not to forget its there. Mattresses should be placed on a blanket and not on the ground as while you are driving there will be some movement and you don’t want to rip or tear the mattress. Once you’ve tied the mattress and art off its time for the couches. Couches do not stack well they generally won’t sit flush and leave awkward sized gaps. You want to get the feet of the couch into the wall with its back to the mattress. Alternatively if the couch is too tall to stand, place the knees of the couch into the wall. This is where the load starts to become more difficult. You either want to stack dining chairs in or around the couch or basically anything without too much weight. Dining chairs should be wrapped individually in blankets to protect them. Once you’ve got all couches and armchairs its time to get the dining table in. First check the legs of the dining table to make sure that when the truck is moving the legs don’t snap. If the table doest feel that strong you’ll have to tie it off with is back to the wall. This can lose you space inside the legs as you don’t want anything too heavy in there that might snap the legs off. Dining chairs or linen bags can be great to fill that gap. The least fun part of any move is the white goods. They mark easily and are expensive to repair or replace. They should be the last on and the first off at the other end. Tied to the back wall of the truck wrapped in two blankets. Next to the fridge i will generally have a washing machine. if there is enough space, you can put the drying next to the washer but they will transport ok stacked on top of each other so long as they have adequate protection. So hopefully this article gave you a better idea of how to pack a removalists truck and make you move day a little smoother! If you want to be even more ready have a quick read of this article to save you time!